The first circuit was pretty straightforward. I had to build a basic circuit. The process was smooth and it worked well. The second part of the assignment was to pick a quote and make a circuit based on it. My goal for picking up a quote was to pick a short, but effective quote. The quote that I picked was “It’s the kind of kiss that inspires stars to climb into the sky and light up the world.” My idea for building the circuit was that there would be a switch, which would light up three stars in the sky. The three stars would would represent lightning up the world. For the final part, I decided to build a bat origami. I started from making a prototype on plane paper. I though about how the circuit should be arranged on a very compact paper. 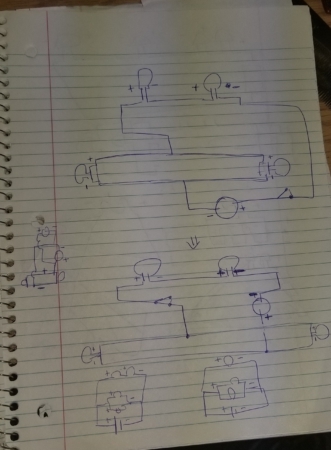 Before implementing the actual circuit, I drew different circuits. It helped me in making the process smoother. After drawing the circuits, I drew the same circuit on the origami. It gave me the idea of organizing the circuit on the bat. My plan was to have four LED’s, two of red color and two of orange. The first two red LED’s will be at the position of eyes, and they would be connected in series. Those two LED’s will have a parallel connections with the other two orange LED’s. I end up making the circuit on origami, but it ended up not working. After putting many hours, I realized that I made a mistake in connecting two LED’s, which were in series. I had to change my entire circuit because of that mistake. After changing the circuit, there was some other problem, which I was not able to figure out. I think that my circuit was a bit complex. The second prototype did not work because of some complex connections. So, I decided to create another circuit with much easier connection, all LED’s connected in series. This design was much smoother than the second one. My final product worked, and it ended up lighting the all four LED’s. It was a bit surprising to me that they worked without any resistors. I thought that I would need resistors, because of different voltage of LED’s. The best thing about the final product was that no part of circuit was visible from front. The entire circuit becomes hidden, and end result looks neat. This assignment was surely a rough ride for me. I think that I made things more complicated. I should have started by designing a simple circuit, which would have made the process simpler. It was a challenge to fit the entire circuit in that triangle, and to think that the copper tapes should not touch one another after folding the origami. It was also a bit difficult to manage the copper tape, because the current was not passing through the adhesive side. Many times the LED’s did not light up because it was connected to the adhesive side of the copper tape. I liked how the LED’s were connected in series, and they were lighted up without any resistor connected. Before beginning the project, I though that it would be straightforward and very easy, because of learning about them in physics classes. However, the implementation was not at all straightforward. However, I was happy with the end result.